Israel has failed to demonstrate that it will conduct thorough and impartial investigations into alleged laws-of-war violations by its forces during last year's Gaza conflict, Human Rights Watch said on Sunday. An independent investigation is needed if perpetrators of abuse, including senior military and political officials who set policies that violated the laws of war, are to be held accountable, the New York-based group said. On Thursday, HRW met with military lawyers from the Israeli military to discuss the investigations. While the military is conducting ongoing investigations, officials did not provide information showing that these will be thorough and impartial or that they will address the broader policy and command decisions that led to unlawful civilian deaths, the rights group alleged. "Israel claims it is conducting credible and impartial investigations, but it has so far failed to make that case," said Joe Stork, deputy Middle East director for HRW. "An independent investigation is crucial to understand why so many civilians died and to bring justice for the victims of unlawful attacks." In one case, a military investigation apparently missed an important piece of evidence: remains of an aerial bomb found in the Al-Badr flour mill outside Jabaliya. Israel denied targeting the mill from the air, as alleged by the United Nations Fact Finding Mission on the Gaza Conflict. However, video footage obtained by HRW and released on Sunday shows the apparent remains of an Israeli MK-82 500-pound aerial bomb in the damaged mill, and UN de-miners say they defused the bomb. Israel's rebuttal to the UN mission is just the latest its its "constant efforts to escape responsibility for committing war crimes in Gaza," Hamas spokesman Fawzi Barhoum said on Sunday. "Yet again, Israel seeks to mislead international human rights organizations by conducting investigations based on fabricated and forged evidence," Barhoum said in a statement. "Such obstruction, by either party, ... affirms involvement in these crimes." He said evidence of Israel's efforts in this regard were confirmed in Sunday's report. HRW, meanwhile, has also accused Hamas and its forces of violating the laws of war. More than 750 Palestinian civilians in Gaza were killed during the conflict, according to the Israeli human rights group B'Tselem. The UN has said that nearly 3,500 homes and 280 factories were completely destroyed. HRW documented 53 civilian deaths in 19 incidents in which Israeli forces appeared to have violated the laws of war. Six of these incidents involved the unlawful use of white phosphorus munitions; six were attacks by drone-launched missiles that killed civilians; and seven involved soldiers reportedly shooting civilians who were in groups holding white flags. According to Israel, the military has conducted roughly 150 investigations of incidents in Gaza, but it has not provided a list of the cases. Nearly 90 of the 150 investigations are what the military calls an "operational debriefing" – tahkir mivza'i in Hebrew. These are after-action reports, not criminal investigations, in which an officer in the chain of command interviews the soldiers involved, with no testimony from victims or witnesses. Forty-five of these 90 cases have been closed. However, the Israeli military also says that military police have opened 36 criminal investigations, in which a military police investigator takes statements from soldiers and seeks testimony from outside sources. Seven cases were closed due to lack of evidence or because the complainants were unwilling to testify. The remaining 28 are ongoing. To date, military courts have convicted only one soldier of wartime abuse during the Gaza conflict, for theft of a credit card. The soldier incurred a seven and a half month prison sentence. According to HRW, the Israeli military has thus far examined specific incidents but not broader policies that may have caused civilian casualties in violation of the laws of war. But neither is Hamas known to have prosecuted anyone for firing hundreds of rockets indiscriminately into Israel, HRW pointed out. On 27 January, the Islamic movement issued a news statement and report summary, saying that rockets from Palestinian armed groups had only targeted Israeli military objects and that civilian casualties were accidental – a conclusion that HRW rejected as "legally and factually wrong." Hamas released a full report about its conduct during the war on 3 February that HRW said it was still reviewing. Last September, the UN fact-finding mission, headed by South African justice Richard Goldstone, found evidence that Israel and Hamas had committed war crimes and possible crimes against humanity and called on both parties to conduct impartial investigations within six months. On 5 November, the UN General Assembly endorsed the Goldstone report and asked UN Secretary-General Ban Ki-moon for a progress report about domestic investigations. Ban gave his report on 4 February, passing on documents provided to him by Israel and the West Bank-based Palestinian Authority, and reiterating his call for credible and impartial investigations by all sides. "Secretary-General Ban merely passed on the parties' claims, but he also reasserted the importance of credible investigations in conformity with international standards," Stork said. "The pressure is still on Israel and Hamas to show that they will do it right." UN Secretary-General Ban Ki Moon said "No determination can be made on the implementation of the resolution by the parties concerned," during the meeting of the General Assembly on Thursday, prompting an outcry from the Palestinian Center for Human Rights. Ban made the statement, PCHR said, "despite the fact that Resolution A/Res/61/10 explicitly called for the Secretary-General to 'report on the implementation of the present resolution'." The organization, based in Gaza, continued, saying "As representatives of the victims of the atrocities committed during the Israeli attacks on Gaza in December 2008 and January 2009, PCHR is shocked and appalled by this lack of responsibility." Ban's statements came after Israel, the Palestinian Authority and the de facto Government in Gaza all handed over short reports detailing alleged progress on investigations into Justice Richard Goldstone's allegations of war crimes uncovered during his summer fact-finding mission. Shortly after Ban delivered his address, Israeli Defense Minister Ehud Barak claimed that "Ban Ki-Moon was very impressed by the presentations given in UN by the military advocate general and even mentioned this to me personally," the Israeli daily Yedioth Aharanot reported. Meanwhile, the Israeli Foreign Ministry on Friday defended Israel's response "This document completely expresses Israel's commitment to conduct an honest internal probe according to the standards of international law," according to the Israeli daily Haaretz. "Despite the difficult conditions of fighting against Hamas terror, Israel has stringently abided by international norms and will continue to do in the future - though our foremost obligation is to protect our citizens." In its report released Friday afternoon, PCHR stated, however, that "investigations carried out by Israeli authorities do not, in any way, fulfill the demands of customary international law, the Goldstone Report, or UN General Assembly Resolution A/Res/64/10." The statement explained that "the Israeli system – as it relates to Palestinian victims of Israeli violations – does not meet the necessary international standards with respect to the effective administration of justice. The hierarchical nature of the military, the ineffective manner in which investigations are conducted, the lack of civilian oversight – as epitomized by the wide margin of discretion awarded by the Israeli Supreme Court – and the ineffectiveness of such oversight when it does occur, all combine to fundamentally frustrate the pursuit of justice." Supporting their claim that military probes were "inappropriate and legally inadequate," PCHR noted that Israeli military investigations had opened so far 150 investigations of which 36 were criminal investigations. Of those, the organization said, seven were dismissed before the report was submitted to the UN for "lack of evidence." "PCHR alone submitted 450 criminal cases," the statement reminded. Citing their "long-standing experience as well as that of Israeli and international human rights organizations," PCHR said it was "evident that accountability cannot be pursued through the Israeli legal system." Criticism from PCHR extended to the PA and de facto government. Its report noted that "both the authorities in the Gaza Strip and in the West Bank have failed to conduct the required investigations, and have thus violated the terms of the General Assembly Resolution." Following a 16 October announcement by the de facto government that it would begin investigations, officials handed over a report on Wednesday. PCHR reviewed the report and "found it to be disappointing; it merely confirmed that the government in Gaza has failed to establish an credible, impartial investigation committee to lead an inquiry into the allegations of the Goldstone Report." Commenting on the PA efforts that started in January, PCHR said "The efforts came far too late and exhibited a lack of professionalism." Moreover, the organization said, investigations into allegations of war crimes in Gaza is "impossible from the West Bank as a result of the current political split and the establishment of such a Commission merely pays lip service to the rule of law." PCHR called the actions of both governments a "missed opportunity," and said "such politically irresponsible behavior can only result in the undermining of the efforts exerted by the UN Fact-Finding Mission." In light of the failures of all three governments, PCHR recommenced that "the General Assembly should request the Security Council, acting under Chapter VII of the UN Charter, to refer the situation in the occupied Palestinian territory to the International Criminal Court." Upon revelation of allegations of war crimes in the Goldstone report, Israel initially refused to undertake independent investigations into accusations, which the report called for in its conclusion. Last week, Barak called the report "distorted, biased and unbalanced." The Hamas government in Gaza also expressed reticence in conducting its own probe, stating that it had not been responsible for war crimes. The British journalist Robert Fisk said on Tuesday in the British daily The Independent that "Israel's gravest mistake in recent years was to refuse to contribute to Goldstone's report on the 2008-09 slaughter in Gaza. A 'foolish boycott', the daily Haaretz called it. A disaster, according to Israel's liberal left, who rightly spotted that it placed Israel on the level of Hamas." On Monday, Israeli media reported that Israeli findings compounded allegations that white phosphorus munitions were deployed toward an UNRWA compound in Gaza during last year's devastating offensive, with two senior officers being disciplined as a result of authorizing the use of white phosphorus. However, the Israeli military quickly denied the reports that the officers in question had been summoned for disciplinary action. Political commentator Alan Dershowitz slammed Goldstone in an interview with the Israeli Army Radio dubbing him a traitor to the Jewish people on Sunday. "The Goldstone report is a defamation written by an evil, evil man," he said. Despite an overall unwillingness by all concerned parties to launch independent investigations, when the UN General Assembly called on Israel and the Palestinians in November to submit its findings, asking Ki-moon to reply within three months, all sides moved to respond. The Palestinian Authority was widely criticised for having delayed its vote before the general assembly on the Goldstone report, despite the majority of members calling for its findings to be investigated. A Palestinian commission in January into the events that led to the delay revealed a convoluted time-line of events, with President Mahmoud Abbas eventually claiming responsibility. However, Israeli media reported that Israeli security officials had threatened Abbas into staying his vote or the West Bank could see military action on a similar scale to Operation Cast Lead, Haaretz reported. Meanwhile, Israel set precedent in January when it offered approximately 10 million US dollars in compensation to the UN for damages sustained to its structures during its military offensive. Five days after Israel and the Palestinian Authority submitted reports to the UN over progress on internal investigations into allegations made by the Goldstone report, Hamas officials handed in a 52-page summary of local proceedings. Delivered to head of the UN Office of the High Commissioner for Human Rights in Gaza Curt Goering on Wednesday, officials in the de facto government said the document "contained all the information relating to the implimentation of the recomendatiods laid out in the Goldstone report." The Israeli daily Haaretz said this included a section explaining that the death of three Israeli civilians from homemade projectile fire were accidents, and the projectiles were aimed at Israeli military targets. Of the 13 Israeli deaths during Operation Cast Lead, three were civilian. In its statement, the de facto government said it welcomed the opportunity to implement investigations on the fact finding mission lead by Goldstone, as well as pushing forward some of the recommendations. Already, the statement said, a special governmental committee headed by the de facto minister of justice was established. The report allegedly recounts the "transparency and integrity of the procedures being taken to implement the recommendations, particularly those related to claims on violations of the rules of international law." It said officials were preparing to appoint an attorney general to begin investigations necessary relating to the claims outlined in the report and in conjunction with the parameters of Palestinian law. The Hamas government document also stressed the need to ensure that Goldstone's recommendations were implemented not just in Gaza, but in Israel as well. It urged the international community to support and insist that all investigations take place in a clear and thorough manner. 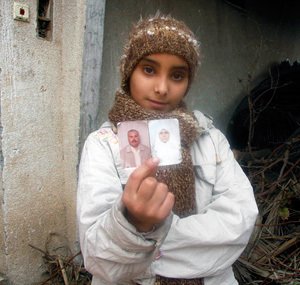 IRIN – Mona Samouni, 12, is depressed and has nightmares about the day – just over a year ago – when she witnessed her parents and several relatives being shot by Israeli soldiers in their home in Az-Zaitoun, southeast of Gaza City. Like a number of other children who witnessed horrific events during last year's 23-day Israeli military operation in the Gaza Strip, Mona has become increasingly withdrawn and silent – common ways of coping with tragedies, doctors say. The killing of Mona's family is one of the most notorious incidents of last year's conflict (see BBC slideshow) and was one of 11 incidents investigated by the UN mission "in which Israeli forces launched direct attacks against civilians with lethal outcome" and in which "the facts indicate no justifiable military objective pursued by the attack." It said Israeli forces "killed 23 members of the extended al-Samouni family" on that day. "There is a significant deterioration in the psychological well-being of Palestinian children who are living in the Gaza Strip, especially after the recent war," Ayesh Samour, director of Gaza's Psychiatric Hospital, told IRIN. According to a study by the NGO Ard Al-Insan in Gaza, 73 percent of Gaza children are still suffering from psychological and behavioral disorders, including psychological trauma, nightmares, involuntary urination, high blood pressure, and diabetes. Samour said children in Gaza were being denied a normal childhood because of the insecurity and instability in their environment. He said a culture of violence and death has pervaded their mentalities, making them angrier and more aggressive. A dearth of health professionals in the Strip and a lack of access to medical equipment means children are not getting the help they need, Samour said. Basem Naim, the de facto minister of health in Gaza, said hospitals and primary care facilities damaged during the Gaza conflict have not been rebuilt due to the blockade of the territory under which Israel bans the entry of construction materials, saying they could be used for military purposes. "Health professionals in Gaza have been cut off from the outside world," Naim said. Hussain Ashour, director of Ash-Shifa Hospital, the main hospital in Gaza City, said it lacks medical equipment and paediatricians. Save the Children Sweden and the UN Children's Fund (UNICEF) on 25 January launched the Family Centres Project in Gaza. "The project will ensure that the right to survival and development of children at risk … is ensured through the establishment of 20 Family Centres in different communities of the Gaza Strip," Patricia Hoyos, director of Save the Children in Gaza, told IRIN. "Its main role is to serve a wide population and to provide quality child protection, educational, health and psychosocial services to all those in need of support," she said. This item comes to you via IRIN, the humanitarian news and analysis service of the UN Office for the Coordination of Humanitarian Affairs. The views expressed are the author's alone. Israel's willingness to punish its own officers is proof enough the country's armed forces committed war crimes, Hamas spokesman Fawzi Barhoum said on Tuesday. The statement followed news reports that Israel took disciplinary action for over a brigadier general and a colonel for their actions during last year's war on Gaza. The disciplinary measures were announced in Israel's official response to the UN's fact-finding mission, which was led by South African jurist Richard Goldstone. Barhoum said that even the "occupation's allegation that it punished its officers for their crimes in Gaza" was "clear evidence and condemnation, [amounting to] official recognition of the commission of war crimes against the Palestinian people." Although later news reports in Israel said military officials "flatly denied" that there had in fact been any disciplinary action, Barhoum nevertheless called the reported move to punish soldiers an attempt to "escape from the International Criminal Court, particularly since the results of the Goldstone report are now on their way to the [UN] Security Council." Both Israel and the Palestinian Authority submitted official reports on the progress of internal investigations of allegations made by the UN-backed report, while Hamas officials promised a response in the coming days. Israeli findings delivered to the UN in response to the Goldstone report compound allegations that white phosphorus munitions were deployed toward an UNRWA compound in Gaza during last year's devastating offensive, Israeli media reported on Monday. The incident occurred two days before the end of Operation Cast Lead on 15 January 2009, in southern Gaza's Tel Al-Hawa neighborhood, the Israeli daily Haretz reported. White phosphorus smoke was used to create a cover, according to the report, to shield Israeli forces from combatants' view, who were in close proximity to the UNRWA compound. The munitions dispersed hundreds of pieces of felt loaded with phosphorus and the report said these pieces landed into the UNRWA compound, causing injury to an UNRWA employee and to two Palestinian civilians who took cover at the location, the daily wrote. The Israeli government's findings assert that this endangered human life, acknowledging international allegations. Gaza Division Commander Brigadier General Eyal Eisenberg and Givati Brigade Commander Colonel Ilan Malka were the subject of disciplinary action after headquarters staff found that the men exceeded their authority in approving the use of phosphorus shells that endangered human life, the Israeli government report said, according to Haaretz. Israel's Peace Now movement and Americans for Peace Now on Monday condemned attacks on the New Israel Fund, which has come under fire for funding human rights organizations whose reports appeared in South African jurist Richard Goldstone's UN report on Gaza. In recent days, a right-wing Israeli organization, Im Tirzu, launched a campaign to discredit the fund, its chair, Naomi Chazan, and some of its grantee organizations, including attacks against Chazan in newspaper ads that show the former Knesset Member with a horn on her forehead. The controversy apparently began after the Hebrew-language daily Maariv ran an article over the weekend accusing the US-based progressive fund of supporting human rights groups whose findings appeared in the final report of Goldstone's fact-finding mission. Peace Now and Americans for Peace Now said in a joint statement that they "are deeply disturbed by the content of this campaign and shocked by its style, which is reminiscent of dark times in our people's history." The groups added: "The NIF grantees that are quoted in the UN report on Operation Cast Lead were performing their duty as Israeli human rights organizations by monitoring and reporting on controversial policies of their government and their military. Such human rights organizations are an integral part of any vibrant democracy and as such, they are an integral – and vital – part of Israel's civil society." Peace Now is Israel's leading peace movement. APN is America's leading Jewish peace organization. The groups further stated that the fund is an asset to Israel's democracy, including its grantee organizations. "Attempts to silence them should not be tolerated by the Israeli public and by friends of a free and democratic Israel worldwide," the movements said. "We call on all Israelis and on American friends of Israel to join us in denouncing and rejecting these contemptuous attempts to muzzle Israel's civil society groups, to quell dissenting voices in Israeli society and to demonstrate civility when discussing and debating issues of public policy," the joint statement concluded. Meanwhile, the pro-Israel group J Street said it was "gravely concerned about escalating threats to the character of Israel's democracy," according to a statement, which condemned the "new attacks on organizations defending its democratic values and on individuals exercising their basic democratic rights." "Im Tirtzu’s political leanings are clear," J Street added. "This is a pro-settler group, with $100,000 of funding from Christians United For Israel, a conservative Christian Zionist organization run by Pastor John Hagee, who once stated that God sent Hitler to drive Jews to Israel. J Street called on Im Tirtzu to immediately pull the ads that are part of "this shameful new campaign." The US lobby group added that the campaign is just the latest example "of a perfect storm brewing" that threatens the core of what it called Israel’s democratic character. "Pro-Israel Americans should stand up for Israeli democracy, not work to actively undermine it. We call on Americans who care about the character and quality of Israel’s democracy and civil society to join us in calling on Im Tirtzu to cease their despicable campaign," the statement concluded. J Street is gravely concerned about escalating threats to the character of Israel’s democracy – including vicious, new attacks on organizations defending its democratic values and on individuals exercising their basic democratic rights. This weekend, an organization called Im Tirtzu launched an outrageous campaign viciously attacking New Israel Fund President and former Deputy Speaker of the Knesset Naomi Chazan in a style reminiscent of propaganda from the darkest days of recent Jewish experience, depicting Chazan with a horn on her head and holding her personally responsible for the contents of the Goldstone Report. Im Tirtzu’s political leanings are clear. This is a pro-settler group, with $100,000 of funding from Christians United For Israel, a conservative Christian Zionist organization run by Pastor John Hagee, who once stated that God sent Hitler to drive Jews to Israel. Funds collected for Im Tirtzu in the United States are directed through a New York City-based charity which funds construction over the Green Line. J Street calls on Im Tirtzu to immediately pull the ads that are part of this shameful new campaign. Their campaign is but the latest example of a perfect storm brewing that threatens the core of Israel’s democratic character. One can clearly connect the dots between what’s happening in Sheikh Jarrah and to women at the Kotel to this latest ugly attack against this former Knesset member with a distinguished record of service to Israel. Israel should be a symbol of Jewish and democratic values in action. It was founded with a strong commitment to the values of justice, equality, and democracy that are core to the Jewish people. An attack – such as the unconscionable ads run by Im Tirtzu – on those who would defend that vision of Israel is an attack on all of us who hold these values dear. Pro-Israel Americans should stand up for Israeli democracy, not work to actively undermine it. We call on Americans who care about the character and quality of Israel’s democracy and civil society to join us in calling on Im Tirtzu to cease their despicable campaign. UN Secretary General Ban Ki-moon is set to deliver his report on progress made in Israel and Palestine on investigating allegations of war crimes made in the UN-mandated Goldstone report on 15 February. Ban will deliver his report to the General Assembly for debate, after which the resolution of the General Assembly will be passed on to the UN Human Rights Council. On Wednesday, the de facto government in Gaza announced it would “soon hand over its response to the Goldstone report.” Speaking to reporters, Minister of Justice Muhammad Faraj Al-Ghoul said the document would be 52 pages and readied for handover to the Director of the High Commissioner on Human Rights in Gaza in time for Ban to review and report on its investigations. The de facto government formed a committee to “monitor and document Israeli war crimes,” and added that “Gaza was open for all the [UN] delegations, missions and international committees to see the war crimes committed by the occupation in Gaza,” the official said. Al-Ghoul did not make clear whether the document would address allegations made by the Goldstone report, on crimes committed by fighters in the Gaza Strip and the de facto government against both Palestinians and Israelis during and before the war. He also assured that while the Goldstone report only detailed 36 war crimes allegedly committed by Israel, the de facto government document would give a comprehensive report on more than 1,500 different war crimes all in contravention of the Rome Statute. On Monday, Israeli Information Minister Yuli Edelstein the Hebrew-language daily Yedioth Ahronoth that Israel would not look into the Goldstone allegations, calling the report “anti-Semetic.” Officials have said a formal response would be delivered to the UN ahead of the deadline, but analysts believe it will be an attack on the report rather than a response. On Tuesday, Israeli Prime Minister Benjamin Netanyahu said he was considering appointing a legal team to review the military's investigations and debriefings, but not a full and independent investigation. The Israeli government often cites an early internal investigation by the military that found no misconduct by its soldiers as sufficient internal inquiry. If neither Israeli nor Palestinian sides produce a thorough investigation that responds to the allegations in the Goldstone report, Ban could pass on the file to the International Criminal Court (ICC). Although Israel is not a member of the ICC, Palestine is going through the process of becoming a full member. Because the alleged crimes took place on Palestinian soil, the ICC would have automatic jurisdiction over the case. Alternatively, as war crimes and crimes against humanity are international violations, the ICC could also claim universal jurisdiction and proceed with the case without Israel's authorization. Israel will submit its refutation of the Goldstone report to the UN on Thursday, with the aim of dispelling the report’s conclusion that war crimes were carried out by the Israeli army, American media reported on Sunday. While the content of Israel’s rebuttal remains confidential, officers involved in its compilation told the US daily The New York Times that, among the allegations put forward, Israel will deny that it caused the ruin of the Badir flower mill and the destruction of a water waste plant causing a deluge of raw sewage, suggesting that it may have been hit by Hamas explosives. The two cases, along with the destruction of chicken coops, water wells, a cement plant and some 4,000 homes, are indicators in the Goldstone report that Israel intended to destroy infrastructure to cause intense civilian suffering, a war crime under international law. Maj. Gen. Avichai Mandelblit, the Israeli military advocate general, said in an interview with the daily that those assertions went beyond anything of which others had accused Israel. "I have read every report, from Human Rights Watch, Amnesty International, the Arab League ... We ourselves set up investigations into 140 complaints. It is when you read these other reports and complaints that you realize how truly vicious the Goldstone report is. He made it look like we set out to go after the economic infrastructure and civilians, that it was intentional. It’s a vicious lie." The Goldstone report called on both parties concerned to undertake independent investigations into the allegations put forward by the committee’s findings. Israel has so far only embarked on a military probe into the war.